Add sweet potato coins, oil and thyme to the sheet and cover each coin in the oil and thyme. Cover the baking sheet with aluminum foil and place in preheated oven. Bake for 20 minutes. 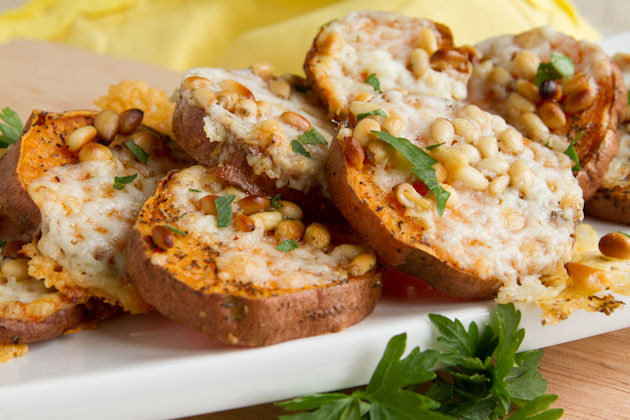 Remove from oven, remove aluminum foil and top coins with cheese and pine nuts. Return to the oven, uncovered. 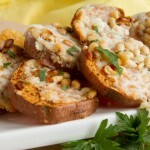 Bake for an additional 5-8 minutes, until cheese has melted and pine nuts are toasted. Transfer slices to a plate and serve as is, or sprinkle with a touch of fresh parsley and sea salt.